As if sketching two Santas in two days wasn’t enough to get me in the holiday spirit, the real treat came when I stopped for a lunch break at Il Fornaio. I grabbed a table closest to where two flautists and a cellist known as Windsong were just beginning a lovely holiday concert. 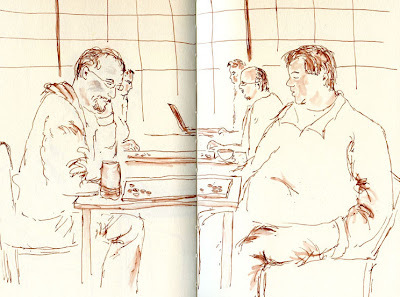 After I finished my sandwich, I sketched them again from one floor up. 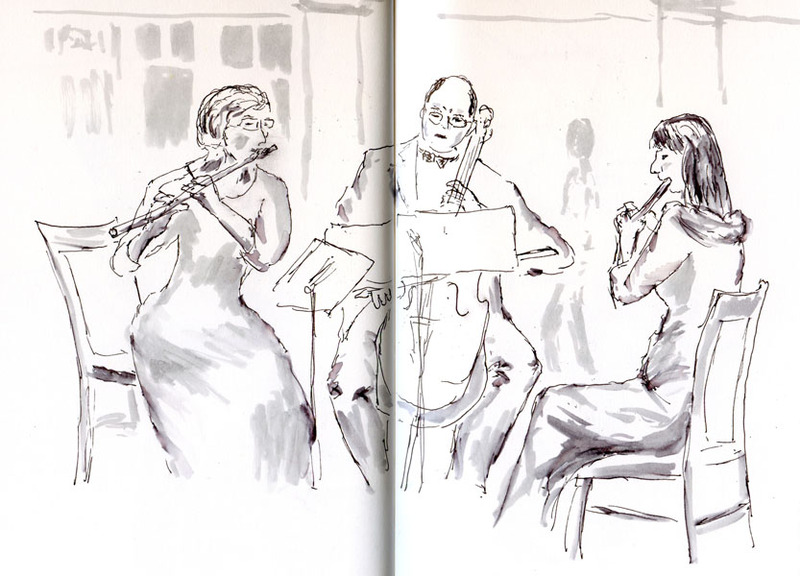 As I discovered over the summer at many farmer’s markets, I can’t think of too much that makes me happier than enjoying live music while I sketch the musicians. Sheltered under the bright retail lights, It almost felt like summer. Two Santas in as many days – I guess I’m on a roll. I had so much fun sketching at Northgate yesterday that I hopped on a bus downtown this morning to Pacific Place, where I knew that Kate had sketched Santa recently. I tried to get up close and personal with Santa as I had at Northgate, but to do that, the angle would have been difficult, or else I would have been standing in the path of commerce (which undoubtedly would have been frowned upon by nearby merchants as well as shoppers). So I walked to the floor directly above Santa and included one of his “elf” photographers checking out the image on a laptop. Walking past a building called 1700 Seventh in downtown Seattle, I stopped abruptly when I spotted two striking sculptures in the lobby. Made of scrap metal and other found objects, the horse sculpture called “Green River” was made by Deborah Butterfield. Next to it were three spheres made of wood, a work called “Events and Incidents, Sphere #3, #5, #6,” by Seattle artist Deloss Webber. 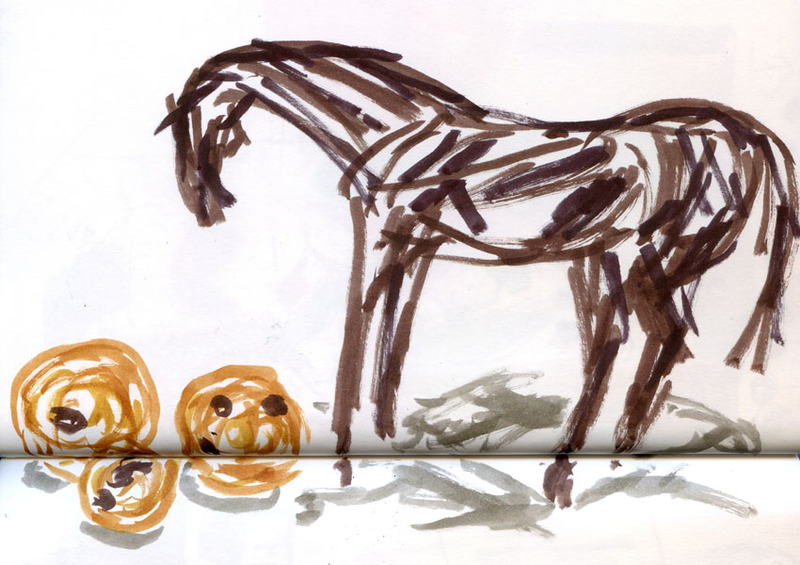 I hoped to convey the abstract quality of these works by using brush markers to capture the angular yet graceful lines in the horse and the organic shapes of the spheres. Santa and his elf photographer weren’t very busy. With nothing else to do, Santa was happy to pose for me once he noticed that I was sketching him. I had a feeling he’d eventually get a customer, so I left some space on his knee. Sure enough, this little tyke showed up. His parents and Santa all anticipated that his trepidation could turn into a full-on bawl, so they knew they had to act quickly. So did I. Fortunately, the tyke was more patient than we expected, and mom and dad were determined to get a smile, so I had enough time to sketch him. 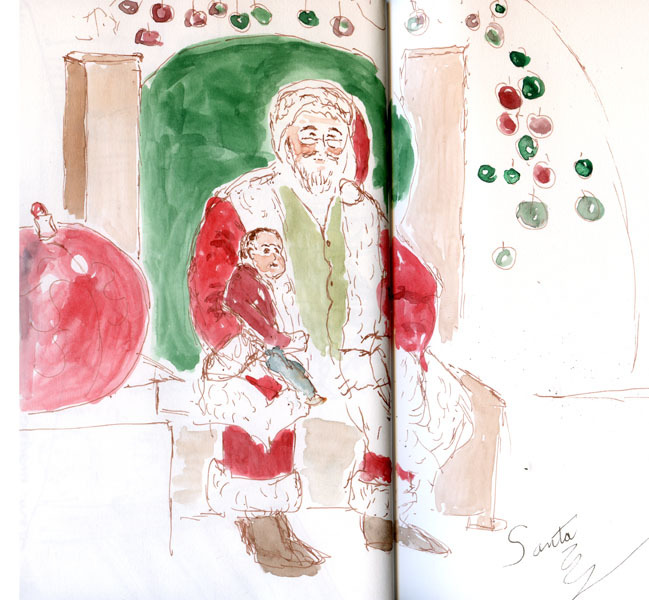 Note that Santa autographed the sketch! Who says there’s no inspiration to be found in retail America? 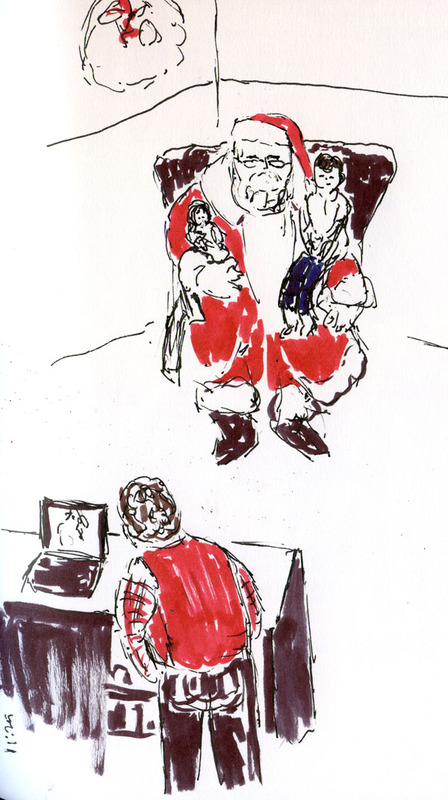 I’ve tried sketching at Northgate Mall before with mixed results, but maybe today I was starting to get into the whole holiday spirit of consumerism and found several sketches there. First was the truck in the parking lot. Then outside Macy’s, I spotted an interesting perspective study of this man taking a coffee break and the store behind him. But the best was yet to come. Parking my car at Northgate Mall, I was about to pull on my hood and make a dash for the entrance when the view of a truck reminded me of a sketch I saw on Steve Reddy’s blog. 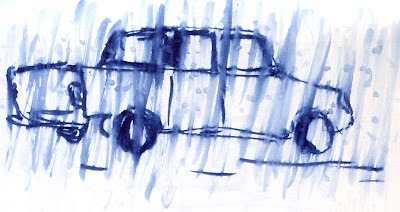 Sketching through his car windshield, he showed the wiggly lines he saw through the rain-streaked glass. 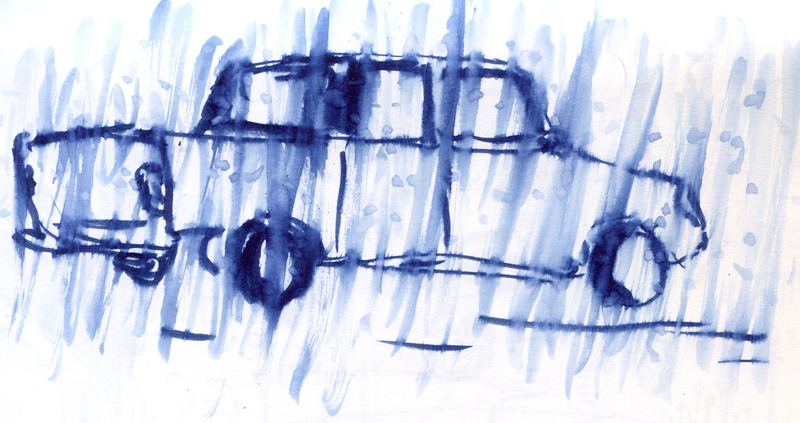 Inspired by that memory, I pulled out a water-soluble Zig marker to sketch the truck. Something happened a couple weeks ago that rarely happens to me: I won a prize! In a random giveaway on their Facebook page, Stillman & Birn gave me a 5.5” x 8.5” Epsilon hardbound sketchbook and a set of Caran d'Ache Neocolor II water-soluble crayons. 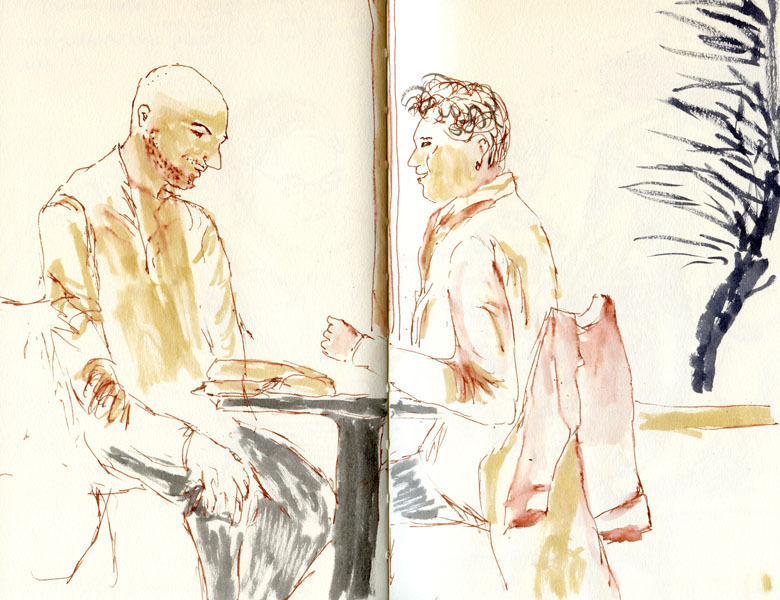 I’ve been happily using the toothier Gamma series sketchbooks for several months now and recently started experimenting with the heavier Beta and Delta series. 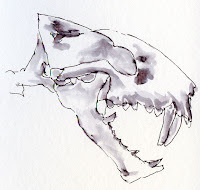 Since I work mostly in watercolor, it hadn’t really occurred to me to use the Epsilon series, which has a plate surface intended for pen and ink. But I’d heard that the Epsilon’s paper weight is the same as the Gamma books I’ve been using with light washes, and I knew that other artists were using Epsilons with wet media,** so I gave it a shot. 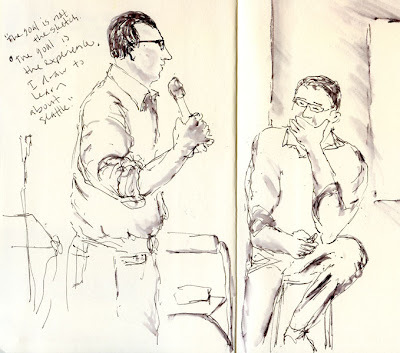 The sketch above was done with a Lamy Safari and Diamine Grey ink with a light wash. When compared to the sketch below that was done with the same ink (plus a Zig marker for the darker shading) on the toothier Gamma book, I prefer the slightly feathery wash that results on the Gamma. The Epsilon paper held up just fine to the wash, but the shading came out looking smoother, almost like it was done with a marker. But what caught my attention was the way my Lamy joyfully skated over the Epsilon surface! I guess that’s why it’s intended for pen and ink. (I almost feel like using it as my journal because it would be such a pleasure to write on it.) One review I read said that ink dries more slowly on the plate surface, which is generally a problem for a leftie like me. But I forgot about that issue as I worked on the sketch above and didn’t even notice whether the ink took longer to dry (and experienced no more smudging than usual; I’ll try writing to see if that’s a problem*). This would be my sketchbook of choice when I'm feeling like using nothing more than a fountain pen without a wash.
﻿﻿Since I’ve only done a few fountain pen sketches in it so far, this isn’t intended to be a full-blown review of the Epsilon. But I’m looking forward to giving it a try with various markers,*** which should look beautiful and behave nicely on that smooth surface. Stay tuned for updates. Thank you, Stillman & Birn, for the nice prizes! ﻿﻿*Updated 11/28/12: Unfortunately, when writing, my hand moves faster than the ink's drying time, so the ink smudged ridiculously. 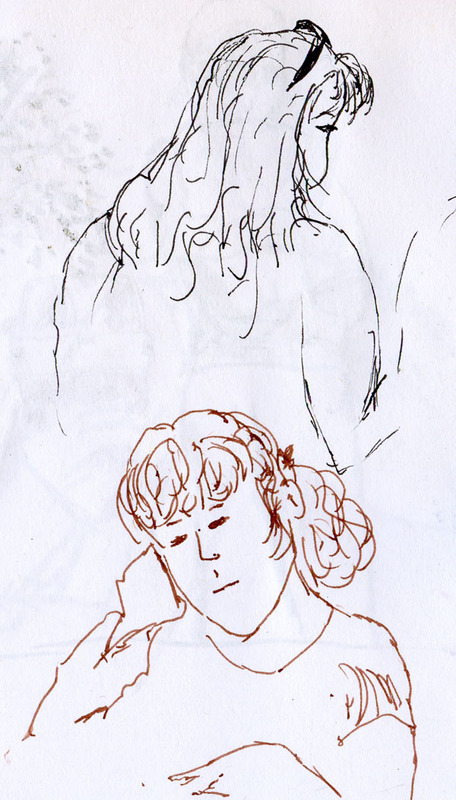 I probably sketch more slowly than I write, accounting for the lack of smudging yesterday. **Updated 11/29/12: Santa gave me an opportunity to give watercolors a try on the Epsilon. The toothless surface isn't ideal, but the paper held up well under washes with only minor buckling. 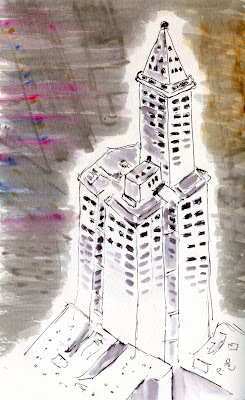 ***Updated 11/29/12: A rain-streaked windshield inspired a sketch with a Zig marker. ***Updated 11/30/12: I used Zig markers again to sketch a pair of sculptures and Santa at Pacific Place. Although it hasn’t been problematic with light wet media, I’d say that the plate finish is ideally suited for fountain pen and markers, which took to the smooth surface beautifully. Given the types of media I use most often, I think I’m going to save the Epsilon for fountain pen and markers, and keep watercolors in my Gamma and Alpha. 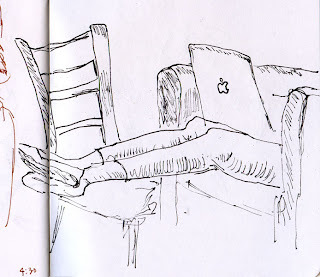 When it’s too cold or wet to work outside, some sketchers stay indoors and sketch from photographs. It’s not the same as drawing from life, but it’s better than not drawing, and it’s still a good way to work on skills. I could have picked one of my own photos from various travels, but the fact is, I’m not a very good photographer, so nothing from my digital collection inspired me. But who says photo sources have to be scenic? I found this magazine photo sufficiently inspiring. Guess what we’re having for dinner tonight? Ears give me a lot of trouble. Something about all that cartilage that folds into gently curving canals in different directions is difficult to draw. Not that mouths or eyes or noses are much better, but when I’m sketching a face, I tend to skate over the ear with a vague outline and dark inner triangular spot, hoping to get away with it. 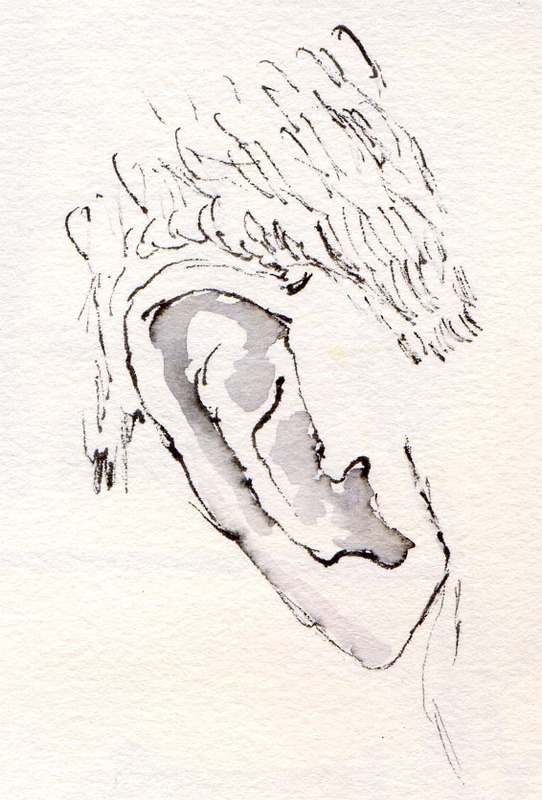 Out of town for the Thanksgiving holiday, my spouse-guy was channel surfing in our hotel room when, with little else to inspire me, I decided to sketch his ear. I suppose if I practiced it a hundred times, I’d get better. But don’t worry – I’m not going to. Finally – a watercolor book for the rest of us! Despite the seemingly hundreds of books found on watercolor technique, very few even mention, let alone focus on, using watercolor as a sketching medium on location. 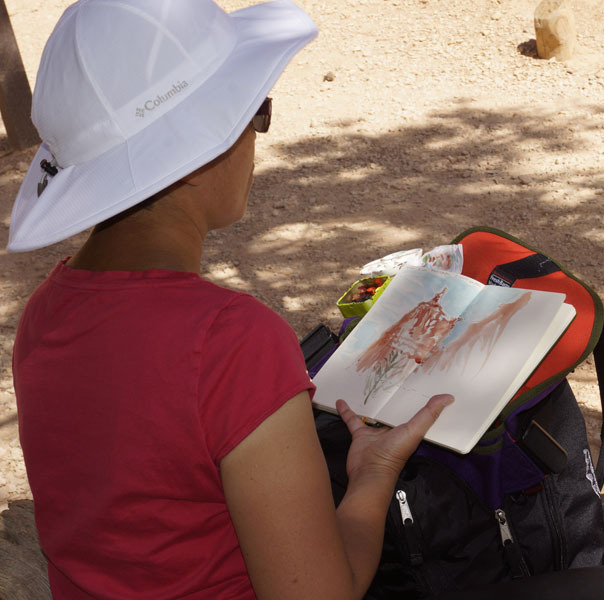 Sure, there are plenty of books about plein air painting, but even those emphasize trying to duplicate the studio setup – a proper easel, stretching and mounting paper ahead of time, etc. – to produce a finished painting (the kind you frame and hang on a wall, hopefully in a gallery). 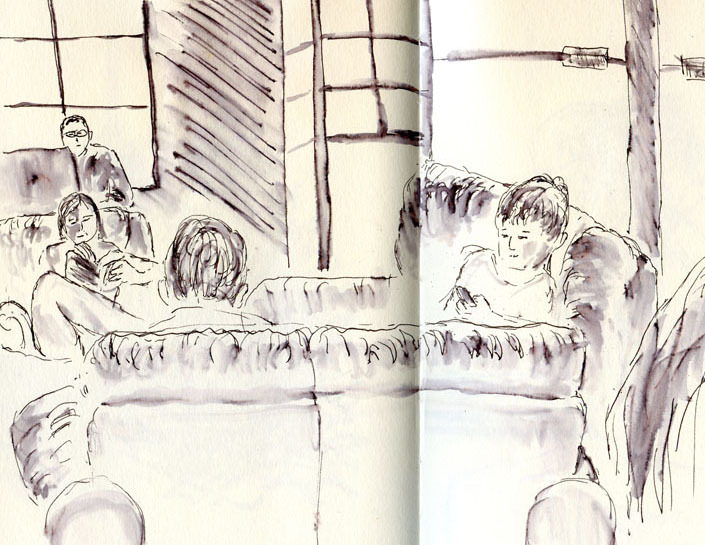 As an urban sketcher, I’ve been frustrated by these books. 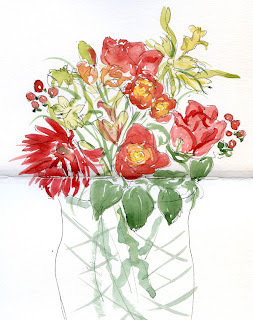 Of course, good technique is good technique, and I still learn about using watercolors from them. 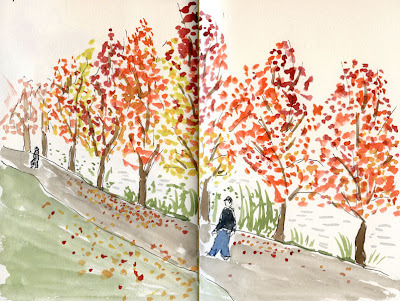 But what about watercolor sketches – the kind that are never meant to leave the sketchbook and instead have the sole purpose of visually documenting a few minutes of my day? Books on that use of watercolors are few and far between. 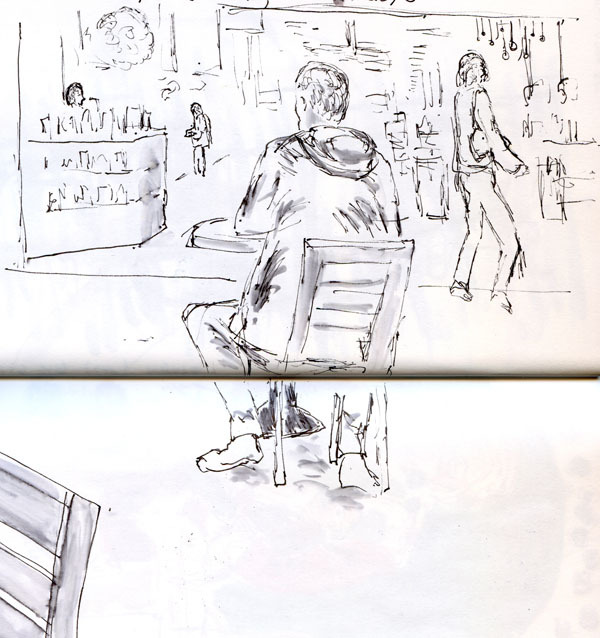 Happily, Sketching, by Alwyn Crawshaw, part of the Harper Collins 30 Minute Art series, is one of those books. Using nothing more than a pencil and a simple setup of watercolor paints, the author gives numerous examples of sketches – brief, fresh images mostly made on location in less than 30 minutes each (many in as few as 10). Every lesson emphasizes distilling and simplifying a scene, avoiding picky details and capturing the essence of what you see. He gives tips on how to sketch moving objects, animals and people, and even how to sketch when you, yourself, are in a moving vehicle. 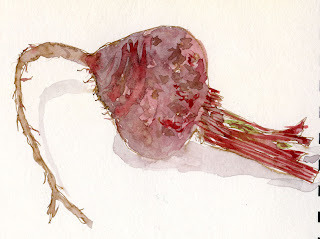 Actual watercolor technique is covered perfunctorily in a few pages, so if you really want to improve your watercolor painting skills, pick up one of those hundreds of other books instead. f I have any complaints, it’s the one that other Amazon.com reviews have mentioned: The book’s format is so small (6” x 7 ¾”) that some of the sketch reproductions are tiny. 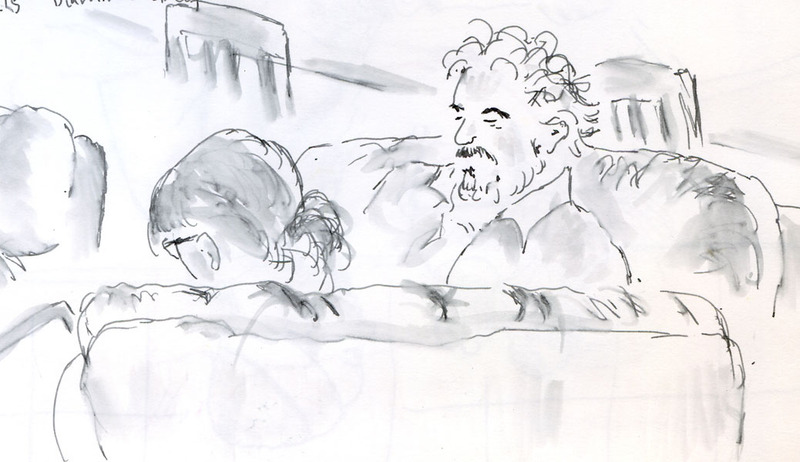 On the other hand, in almost all cases, the originals are no larger than 8 ½” x 11”, and fast sketches are, by definition, small, so perhaps the format is meant to mimic the size of work that most sketchers are making. In general, I’m not a huge fan of still lifes. 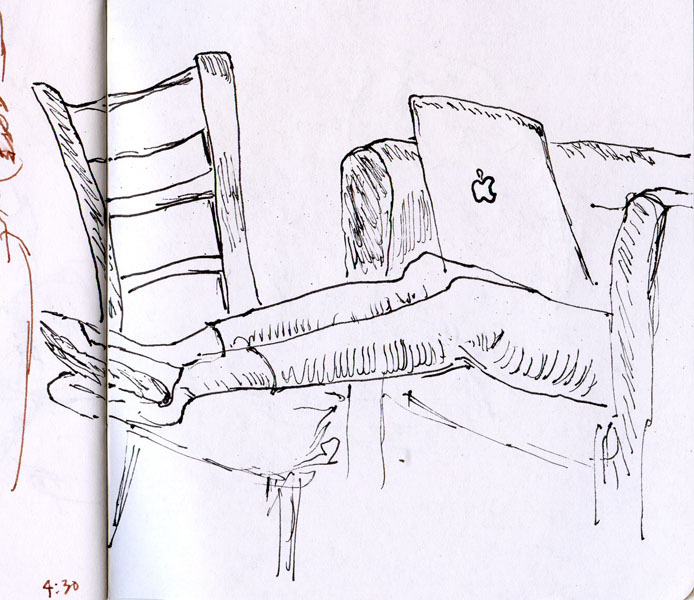 Given a choice, I invariably opt for on-location sketching or even studio life drawing practice over sketching inanimate objects in my house. But today it rained so hard and continuously, accompanied by gusty high winds, that I hunkered down and couldn’t bear to go out, even to a coffee shop. Fortunately, a mostly-fresh birthday bouquet from my spouse guy had enough color to keep me entertained. 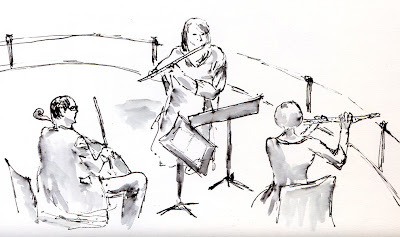 The first sketch, below, was a good opportunity to try a sample of Platinum Pigmented Sepia ink, one of several samples Kate gave me (thanks, Kate!). When I was shopping for brown ink samples a while back, the swatch shown online for this ink looked blah, so I skipped it. But in real life, it’s a pleasant, non-aggressive hue, and here’s what surprised me: it’s waterproof! I wasn’t necessarily looking for a waterproof brown ink – my interest was in finding one with a rich wash – but now that I’ve found this one, I’m thinking it would be a nice warm alternative to my usual Platinum Carbon Black. 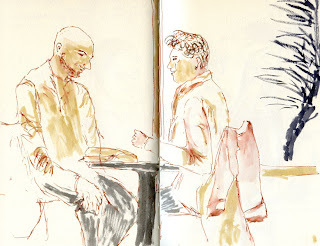 I especially like it on the ivory-colored Stillman & Birn Delta paper. 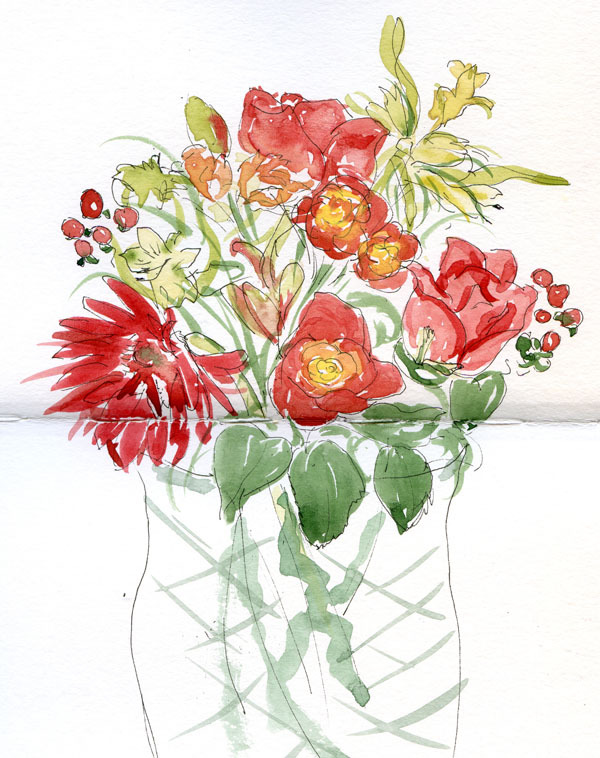 The second still life, above, was drawn with my trusty Copic Multiliner SP pen, which I haven’t been using much since I got hooked on Lamy fountain pens. 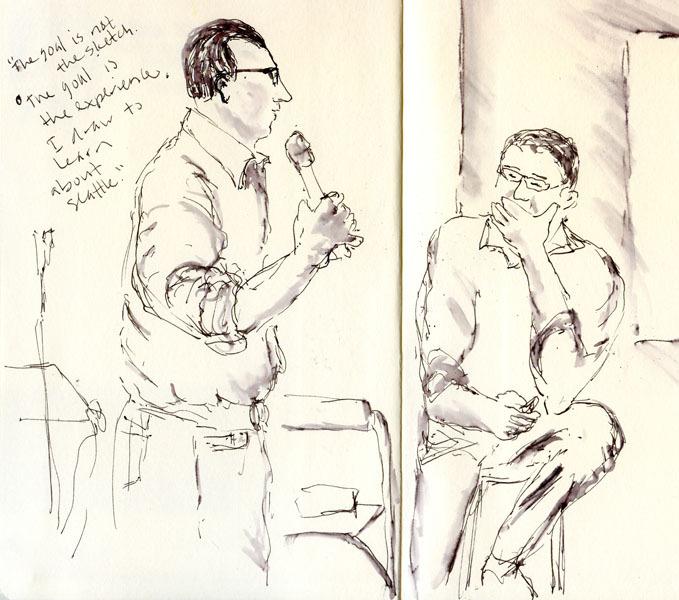 This time I sketched it on a bright white Stillman & Birn Beta page spread (again, thanks, Kate! ), which has a cooler hue but maybe makes the colors pop a bit more. OK, so still lifes have their place. But I’ve already got cabin fever. Even without going up into the exhibits, the downtown Seattle Art Museum is full of interesting interior spaces and artworks, and the Seattle Urban Sketchers made a huge turnout for a sketchcrawl there. Eventually I got up the courage to attempt a somewhat abstract sketch of the cars hanging from the main lobby ceiling (Inopportune: Stage One, a sculpture by Cai Guo-Qiang). 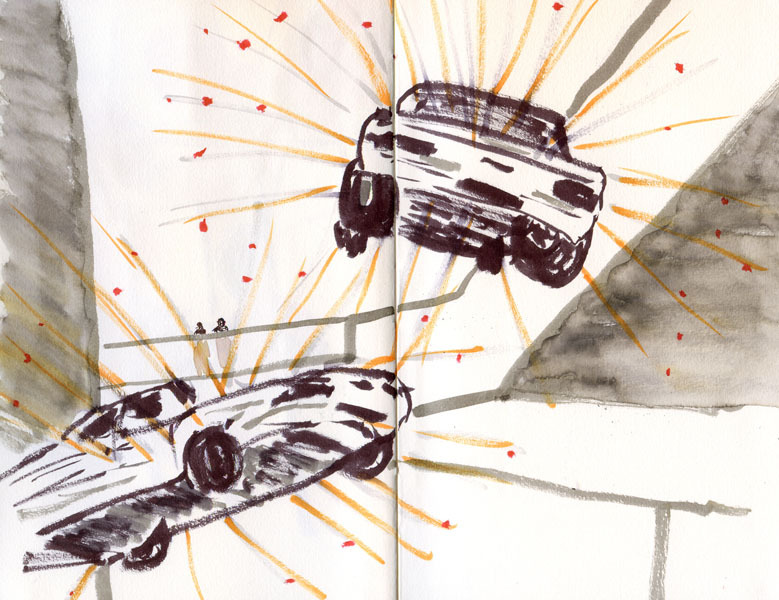 After all, how often do you get a convenient opportunity to sketch the underbellies of a bunch of cars? Back on the ground where the scale of the Pike Place Market is more within my comfort zone, I sketched another Seattle icon – Rachel. 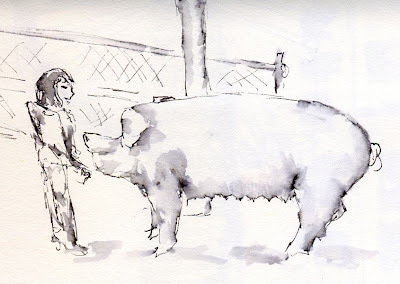 The girl jumped off the pig too quickly for me to sketch her astride, but at least she made it into the sketch. 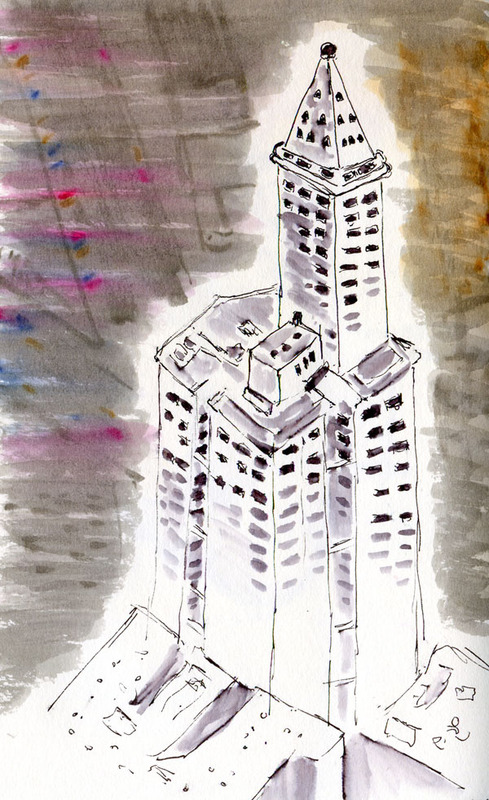 Before I left the 73rd floor, I did what I’ve done in other circumstances when I’ve found myself overwhelmed by a vast scene: I pulled out my trusty brush markers. Against the dark landscape under overcast skies, the Space Needle seemed like more negative space than positive. A lot can change in one year. But sometimes not enough. A year ago today, I went up to the 73rd floor observation deck of the Columbia Center building, Seattle’s tallest skyscraper. I bought a $5 ticket from the lobby’s information desk, and a concierge/guard personally escorted me up there and then left me to sketch to my heart’s content. 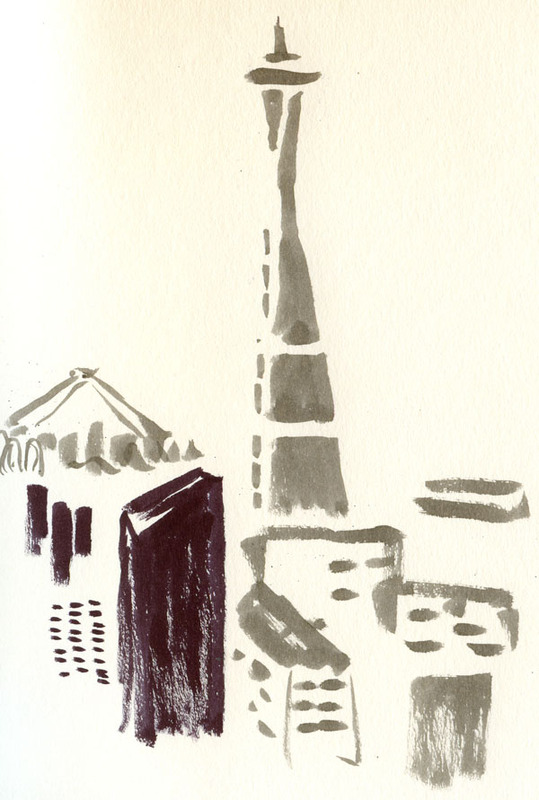 Unfortunately, I had been sketching for only a couple of months, and that spectacular skyline overwhelmed me. 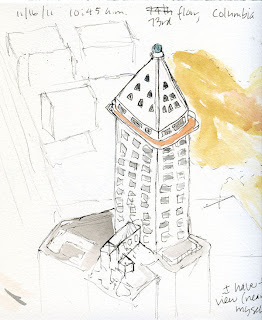 I managed a small, timid sketch of the Smith Tower (below) and vowed to come back someday to give it another shot when I had more sketching chops. That day was today. Once again I approached the information desk to be escorted upstairs, but I was told that I could ride up unescorted and buy a ticket when I got there. I did, and this time it cost me $9. Interestingly, a public restroom is now available on the 73rd floor; a year ago, I was told there was none. Despite the price increase, it’s still a spectacular view. 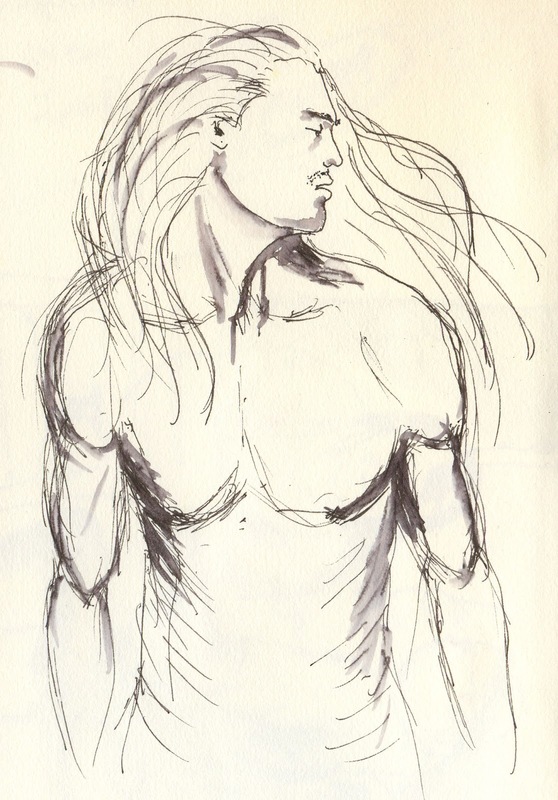 And when I got in front of it, I realized I’d forgotten my sketching chops. I was no less intimidated by that skyline than I had been the previous year. 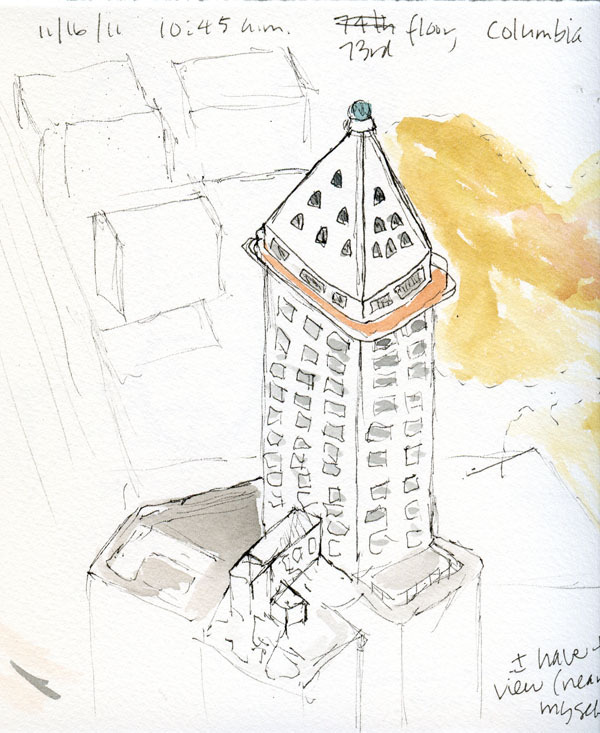 I managed another sketch of the Smith Tower (above), which might have been OK if I hadn’t tried to put in some background. And then I made the background worse by trying to fix it. 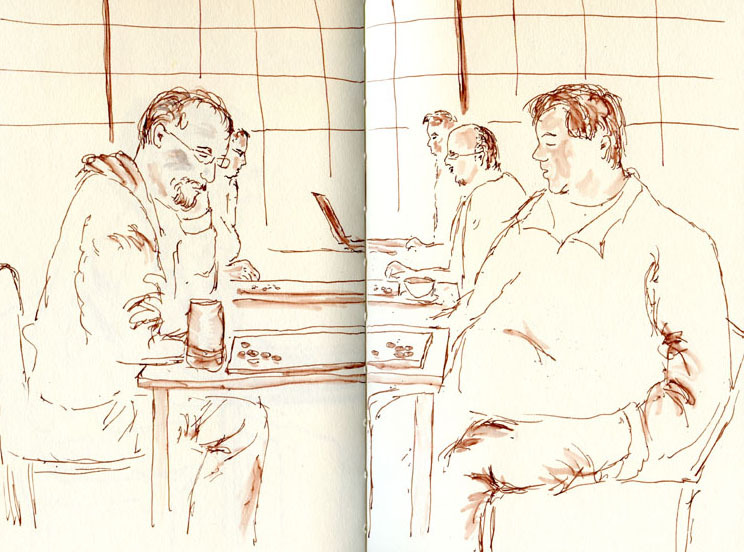 This morning at Zoka, some men were playing a tournament of Go. Each game wouldn’t last quite long enough for me to finish a sketch. 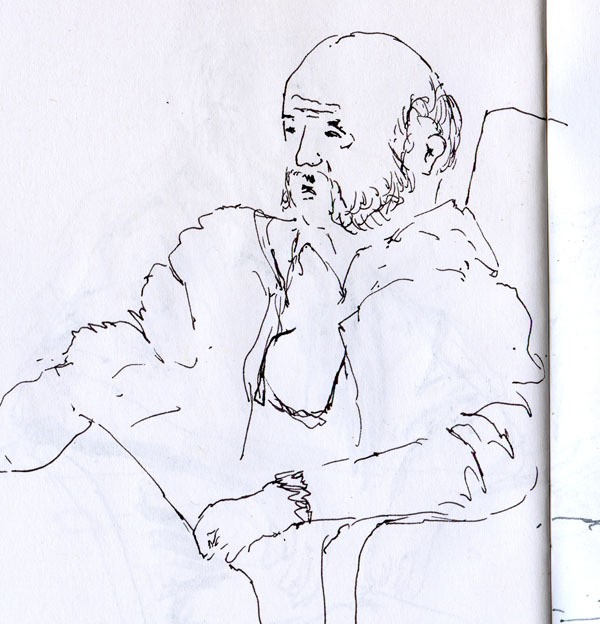 But I found that if I sketched one face that eventually moved on to a different table, I could swap out his body for the one that took the other guy’s chair and continue the composition. Sort of like playing with a Mr. Potato Head. Meanwhile, a boy was busy playing games on his mother’s smartphone – one of the only things that keeps a kid sitting still long enough to be sketched. 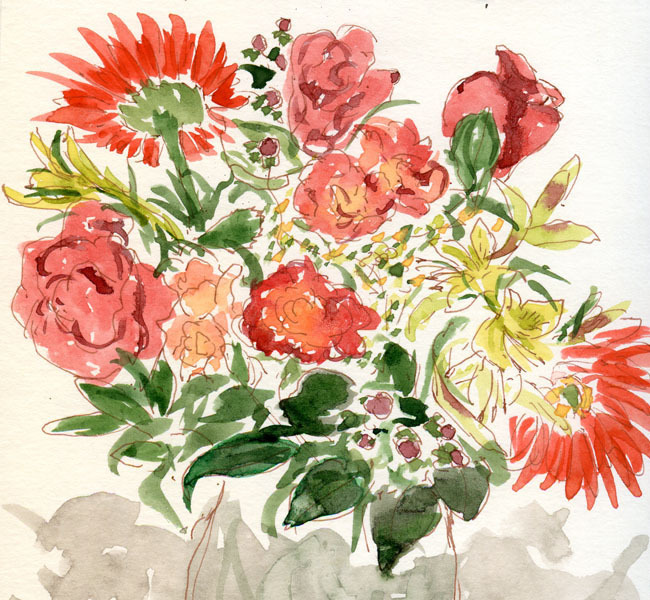 What does it mean to have a sketching “style,” and how do you know when you’ve found your own? 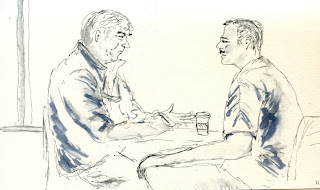 I think about that question now and then when I’m admiring the works of other sketchers. 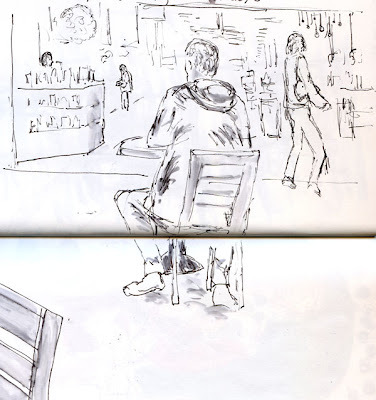 Looking at the blogs of some of my favorite urban sketchers – Gabi Campanario, Gail Wong, Steve Reddy, Liz Steel, Veronica Lawlor and Scott Wilson are just a few that come to mind – I see that each has a distinctive sketching “style” that is unmistakably identifiable and as unique as a signature. How did their styles come to be? 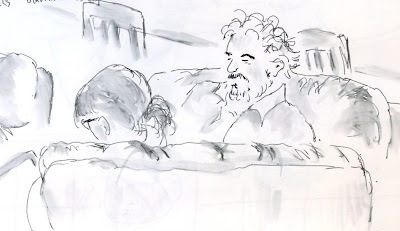 I can’t remember his name now, but when one highly skilled draftsman and accomplished artist was asked how long he had been working when he established the style he was known for, his answer was something like “40 years.” Forty years? As a lifelong journal keeper, I have seen my own journal evolve over the decades from a book of 100% handwritten text to its current mix of writing, collage, abstract painting and sketching, and all the stages in between. 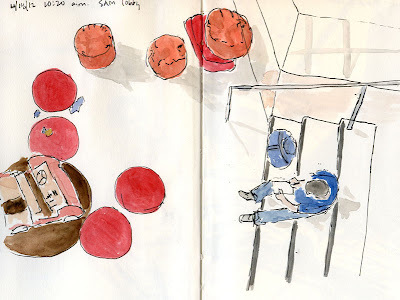 About 10 years ago when I first started making the transition from text to the addition of visual art, I looked at the art journal pages of many, many journal keepers online and in books, and I sometimes found myself feeling what my student had expressed. Vaguely dissatisfied with whatever my art journal looked like at the time, I’d say to myself, “I wish my journal were more like that,” and then I’d proceed to try different media or techniques to bring my art journal into alignment with whatever style I’d seen online or imagined would be somehow “better.” But after a few days or weeks of that, my journal would drift back to whatever came most naturally to me, and I was left with my own style again (however lacking I may have felt it was). When I look over my journals kept over a certain period, I see gradual changes in their format or content, and I realize that those changes came organically rather than as a result of any conscious effort. As much as I might like the look of other people’s journals, adopting their styles would never make them my own. I came to accept that my style is whatever my journal looks like today, which grew out of all the days and years that came before it. In other words, I didn’t find my style; my style found me. A little more than a year into sketching, I intuitively know that what I’ve learned from my journal-keeping process applies to drawing, too. I may be vaguely dissatisfied with my current sketching style, and I may look at other sketchers’ blogs and wish I could draw the way they do. But I’m pretty sure that I can’t go looking for my style; it’s got to find me. 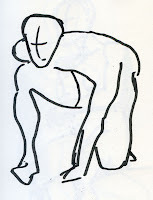 And I also know that the only way it’s going to find me is if I keep drawing, all the time, so that it knows where I am. 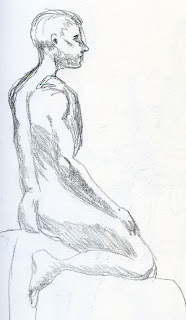 ﻿﻿I spent another morning in Gage’s figure drawing studio. 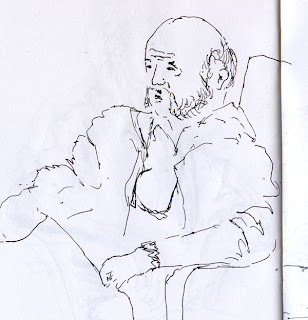 It was my third session there in as many weeks, and I think I’m finally getting into the groove of the figure drawing process – warming up with a series of loose, gestural, three-minute sketches, working up to longer sketches, adding details and shading when the pose is longer. I’ve figured out that I like to use markers for short poses because they are conducive to speed and loose lines, and I like to use Nero pencils for longer poses because they make shading a pleasure. I am starting to see tiny incremental improvements in my work separated by piles of sketches that belong in the recycle bin (although on principle, I retain them in my sketchbook). As I’ve found time and time again, my progress is not progressive. 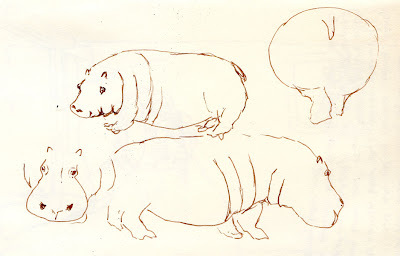 It’s a frustration I’ve come to accept as part of the skill-building process, at least as far as drawing is concerned. As usual, it’s about continual practice. 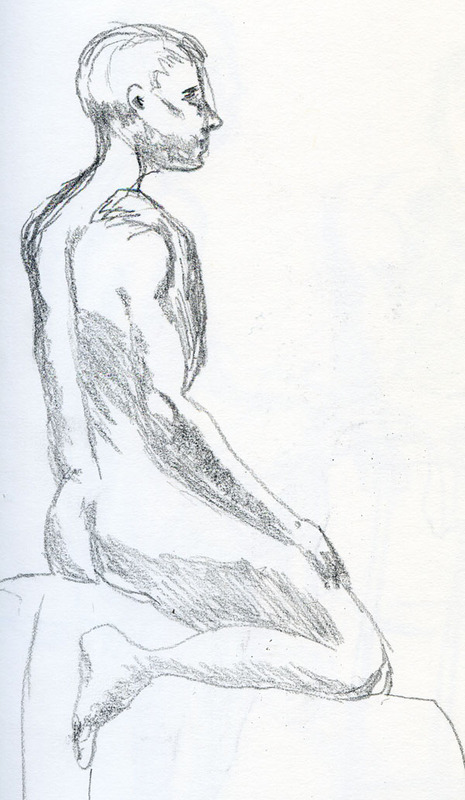 I’ve heard that the Great Masters kept up their regular figure drawing practice their whole lives. 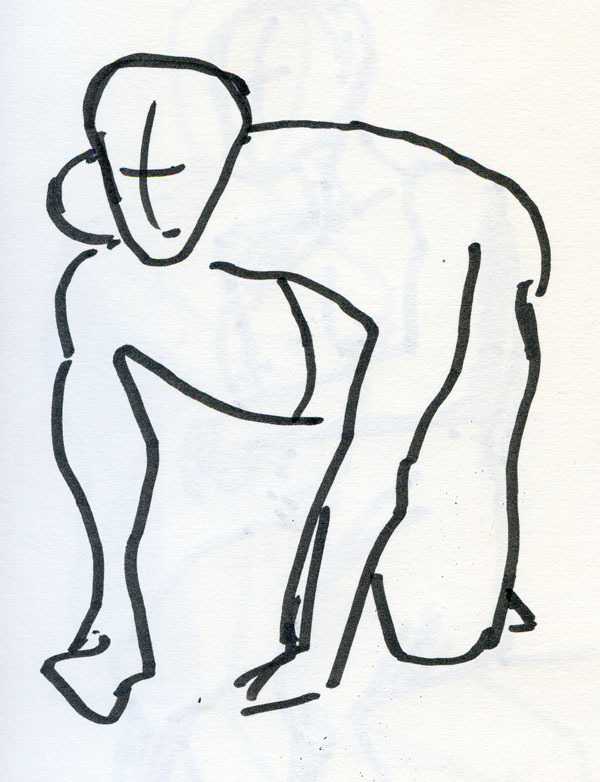 We have to assume that behind all those breathtaking paintings now hanging in museums are piles and piles of 3-minute/5-minute/20-minute sketches that the masters discarded long ago. 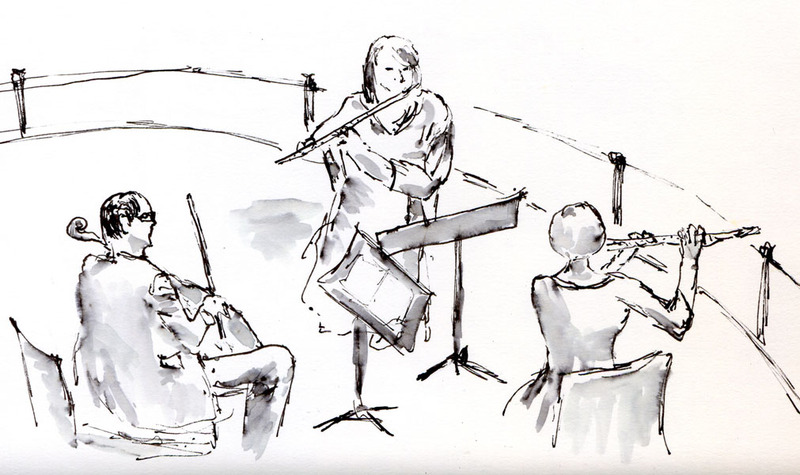 We have to also assume that if they hadn’t kept practicing, they would have eventually gotten rusty, so practice they did. For the rest of their lives. 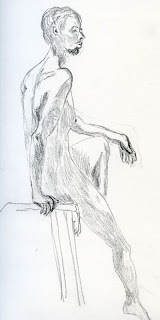 Fortunately, life is full of figure drawing practice waiting to happen – market buskers, pizza vendors, audience members. And in between, there’s always Gage. The Sketchbook Project sketchbook that I began in September is now full. The crappy paper aggravated me every time I tried to do washes, but instead of doing something about it (I know that some participants are gluing in different papers or making other changes to accommodate their media and sketching styles), I decided to stop fighting the paper and use fountain pen inks without washes, which forced me to pay closer attention to lines (not a bad thing – I know I’m guilty of trying to cover up sloppy lines with washes; now my sloppy lines are fully visible). As I thumbed through the thin book, I noticed lots of pages with plenty of white space left on them. Since I still have a couple months before the sketchbook is due, I’m going to go back and fill in some of the spaces with more sketches. Edited 12/19/12: I finished the sketchbook on Dec. 19, 2012. See all 17 page spreads in my Sketchbook Project sketchbook in a Flickr slideshow, or view the images one at a time in my Flickr photostream. The trees at Green Lake are starting to fade, but this stand of maples keeps blazing on. A month ago, they were on fire, even in the shade. 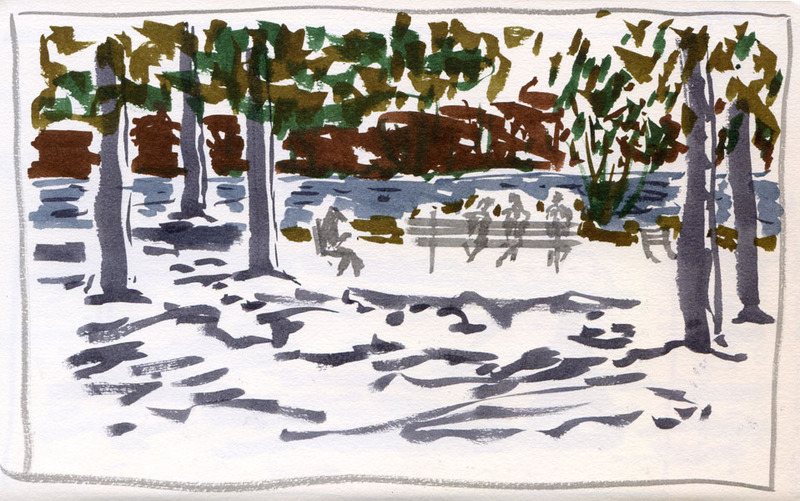 Last winter I spotted a duck with a distinctive “Mohawk” hairdo at Green Lake. I hadn’t seen it prior to that spotting, and after a few weeks, it disappeared. 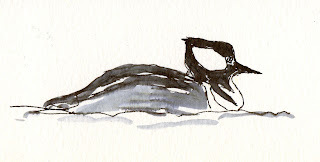 I had mentioned all of this to a birdwatcher friend, and she speculated that what I had seen was a Hooded Merganser. She said that when Mergansers are seen around here, it’s just a layover on their way to their final destination, so after a short while, they move on. The Mergansers are back at Green Lake, where I sketched this male. I had only a fountain pen with black ink, so I couldn’t capture the brown color on the lower half of his body. But I’m happy that I got him in my sketchbook before he flies off again for the year. In the same way that my sketches of people in coffee shops tend to look like floating heads, my sketches of zoo animals tend to be isolated figures. A crane, a giraffe, an orangutan – they all seem to end up in my sketchbooks without context. So just as I’ve been trying to give floating heads in coffee shops a place to be, I decided that on my frequent visits to the zoo, I would try to give animals more context, too. 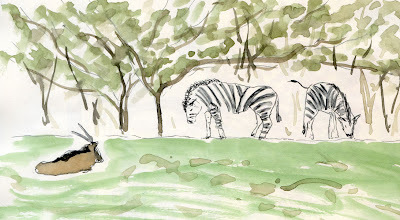 This afternoon I had only an hour before closing time, so I quickly trotted over to the African Savanna exhibit and was lucky enough to catch zebras grazing. A voice on the P.A. system was announcing the zoo’s imminent closure when I spotted a huge, lumbering hippo. No time for context, but I did manage to sketch her (either Guadalupe or Water Lily – I’m not sure which) from all four sides. I’ve said before that it’s difficult finding inspiration in retail America. 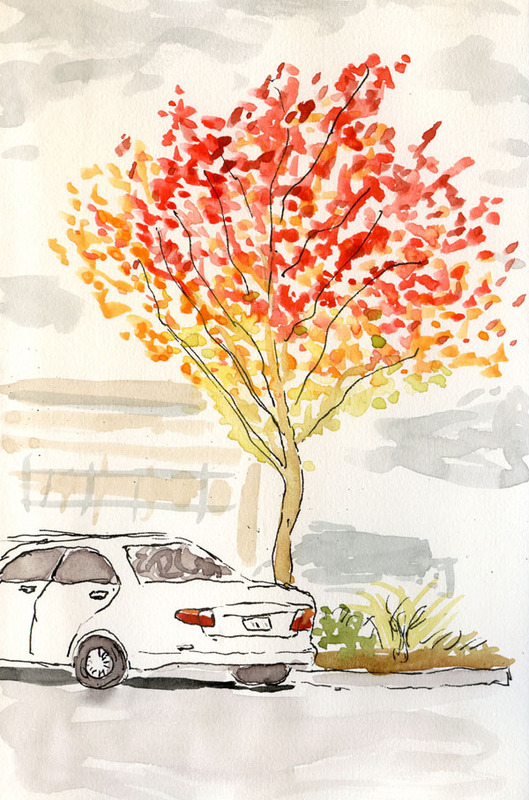 So I guess I sketched this blazing maple tree in spite of myself. After meeting for lunch at Southcenter, Susan and I were still finishing up our conversation outside the restaurant when we both commented on the brilliant colors we’ve been enjoying this autumn, noting the maples planted around the parking lot. I got in my car to drive home, but this tree was too much to resist. 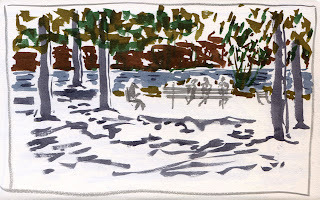 I re-parked to get a better angle and sketched it from the car. It was the second time a tree had inspired me from a retail parking lot, and as I was last time, I was reminded that inspiration turns up wherever you go looking for it – as long as you’re looking.